15 matches into Rodgers’ first season, and it seems Deja Vu has set in for LFC fans. 19 points is what the Red men have gained this season, the same amount of points as under Roy Hodgeson 2 years ago, playing some of the worst football to grace Anfield Road that most spectators had ever seen. But quite frankly, the points tally are where the comparisons end. Not for years has Liverpool played such elegant, dominating football, that wouldn’t look out of place at a Spanish National team training session. LFC has always had a mentally of “pass and move” football, but after the technical stiffness of Houllier and Benitez, then the dour anti-football Hodgson brought to the team, the movement is a sight for sore eyes. Other teams will look at the lack of results with insult, but the fact is that LFC have been incredibly unlucky. From hitting posts, to lack of penalties given (against Norwich, Hotspur, ManU & Chelsea), to down right taking away a legal win (vs Everton), we have got to have to worst run of luck. In fact, our luck rivals that of Wile E. Coyote and Tom from Tom & Jerry. It seems to be only a matter of time before refs calls come our way, and the post hits sneak in, but until then we have to believe in Rodgers. And I do. His style is unrivaled in English football. For such a young manager, so early in his professional career, his impact can not be denied. The game against Saints saw LFC dominate possession for the 13th time this season. 13 out of 15 ain’t bad, right? Especially considering one of those outings was against ManUre and we had ten men for the majority. My point is, you would have to look back to the 80’s for a period in which LFC have dominated possession they way they been have of late. Quite frankly, if we could get back to the dominate times of old, I would be a very happy man! We also have to consider, this squad is something Rodgers has inherited. I can’t wait for a few years when Rodgers has the time to build, sculpted and bring in players that will ultimately play the style as well as possible. Forget about the points for a moment, and just picture the way LFC are playing. Would you have it any other way? 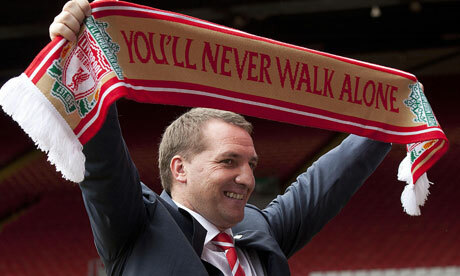 For mine, Rodgers can and WILL get us back into the top4, and it will happen sooner than you think! Onwards and upwards, my fellow Reds!